When does Silent Hill take place? In the comments of a recent post about Silent Hill 2's Otherworld, I had a discussion with a reader about the time period in which the Silent Hill games take place. This is actually an interesting and difficult topic, so I thought that I would dedicate a post specifically to it. 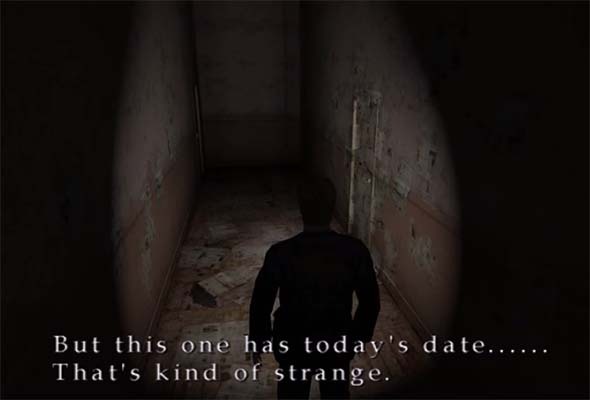 It is very important to note that no specific dates ever appear in any of the Silent Hill games that were developed by Konami's internal Team Silent studio. 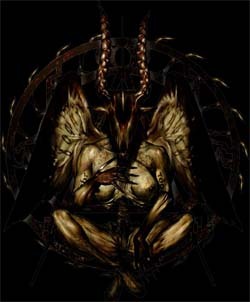 If dates are provided, they are either only the month and day (and not the year), or they are time periods relative to the events of the game (such as referring to the "events of 17 years ago" in Silent Hill 3), or it is just the year of an historical event in the past (such as the document about the sinking of the Little Baroness). Even documents that you would expect to have dates (such as newspapers, journals, diaries, patient reports, and police records) are intentionally left dateless (or at least ambiguous). In Silent Hill 2, there is a point in which James finds newspapers scattered around a hallway. Upon examining the floor or walls, James comments that the newspapers have today's date. This would have been a perfect opportunity for the developers to provide a specific date for the game, if they wanted to. They could have had James read the date on the paper to the player, or the paper itself (with its date) could have been made clearly visible. The developers didn't do this; they left it completely ambiguous. James notes that these newspapers have today's date, but doesn't tell us what the date is. The developers went out of their way to not provide any specific dates for the games. Why would they do this? Typically, works of fiction that are not set in particular time period are written to be contemporary. Unless otherwise specified, most works of fiction should be assumed to take place now with respect to the consumption of the work by its audience, regardless of when "now" happens to be. if it's not contemporary to consumption, then it's usually contemporary to creation. This is usually pretty obvious if the work contains detailed descriptions of locations, technologies, and events that can be easily dated. If we look at the original Silent Hill game in a vacuum, then the game provides no internal indication that it takes place at any specific time period. Players in 1999 probably had no reason to believe that the game took place in any year other than 1999. The same is true for Silent Hill 2, 3, and 4: if looked at in a vacuum, they can all be considered to take place in the same year that they were released. And if you didn't even know the year that the game was released, there's very little within the games to indicate that they take place at any time other than now. However, this assumption falls apart because there is an absolute time difference of seventeen years between the events of the first game and the events of the third game, even though the difference in time between releases of the games was only four years. So we can't assume that each game takes place in the year of its release. At least one game has to be shifted on the timeline. So which game (or games) should be assumed to have taken place when? which was not supposed to be a "re-imagining". This may be old news to some people, but earlier this month, I came across a post on Silent Hill Memories dot net that included scans of the full, 14-page pitch document for the game that became Silent Hill: Shattered Memories. Climax held a contest to give away seven copies of the document to fans, and scans of the document have since been posted online in various sources. The document tells us that the final product ended up being radically different than the original concept. Apparently, Climax did not originally intend to do a remake / reboot / "re-imagining" of the original Silent Hill. Instead the plot would continue on with the standard Silent Hill timeline (presumabely following the events of Homecoming) with a new character. 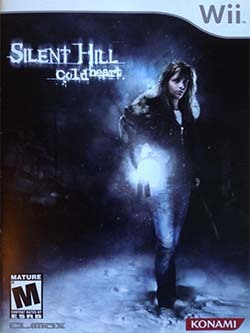 The game's working title was Silent Hill: Cold Heart. The document outlines what some of the game's intended features were supposed to be (including combat mechanics that were completely cut from the final product), describes the main character, and also provides a brief walkthrough of an early chapter of the game. 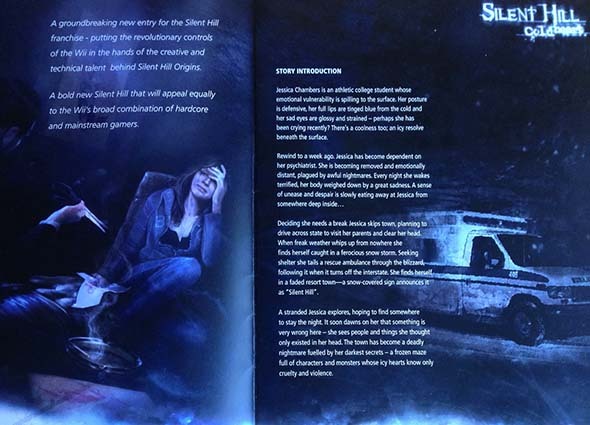 The introduction page describes the playable character: Jessica Chambers. Jessica was planned to be an over-stressed and emotionally-vulnerable college student. She ends up in Silent Hill after a freak snow storm causes her car to crash on her way to visit her parents. Page 1 and 2 describe the main character, Jessica Chambers, and how she ends up in Silent Hill. Jessica is described as being "emotionally vulnerable" and is dependent on a therapist. She has nightmares and is "weighed down by a deep sadness". The pitch doesn't specify the nature of this sadness or her reason for being dependent on a therapist (other than perhaps the stress of college). One of the greatest strengths of the early Silent Hill games - developed by internal Konami studio Team Silent - is their exceptional character design. The characters presented in these games are among the best in all of gaming history at illiciting emotional responses from the players - both positive and negative. It all starts at the top, as the protagonists of all three games stand tall and proud as paragons of game character design. This blog will contain major plot spoilers for Silent Hill 1-3. Read at your own risk! Having relatable and likable characters is essential to the success of just about any horror story (whether in the form of a book, movie, game, or any other medium). It's hard to feel afraid for a character that you just don't care for. Harry Mason of Silent Hill is a great example of a relatable "Joe Everyman" protagonist. Harry is a simple writer trying to take his daughter on a vacation. He wrecks his car and wakes up to find his daughter is missing in a seemingly deserted and haunted town that is closed off from the outside world. Harry isn't a superhero or elite special forces operative. He's just a guy. He could be anybody. This makes him instantly relatable to an audience.